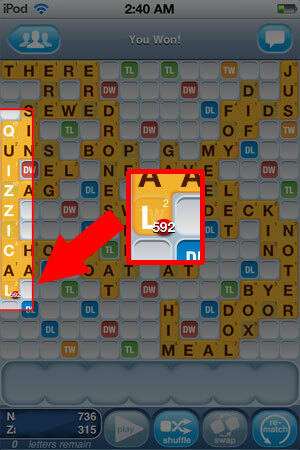 Words With Friends Cheat user Nathan submitted today’s featured Play Of The Day. Nathan played QUIZZICAL for what has to be some sort of record – 592 points. We were taking a short hiatus from POD posting during Spring Break, but had to come back to the table, when we received this in our inbox. The three-hundred something point word we posted a while back was pretty impressive, but this one is just straight up mind-boggling. Nice work Nathan. We addressed this on 3/21 in the comments below. The 2nd Z is a blank tile, which there are 2 per game, so it’s actually possible to have 3 Zs on any given board. Look closer the second Z is a blank tile and has no point value marker on the top right corner. Hey WWFC Admin… how come you haven’t addressed my question yet asked on April 4th???? Well, that part is simple math. When you double something twice, it’s the same at multiplying by four. When you triple something twice, it’s not the same as multiplying it by six (the addition of three plus three). So you are partially correct in that when you hit two DWs, you could just multiply by 4. You get the same result, but technically, it’s not correct math. The correct math equation is to multiply by two, then multiply the result by two again. So you when you hit two triples, you can’t multiply by six. You have to multiply by three and then multiply the result by three again. The assumption that the score for placing a word across two DWs is calculated by the total multiplied times the sum of two twos (four) is incorrect. I got 126 points for the word JOES! I think that is impressive! Don’t you think so? Yes, we agree. Please send a screenshots to: [email protected] to be eligible for the Words With Friends Play Of The Day! Absolutely stupendous score! Can’t see that ever getting beaten. Thats just firggin INSANE!!!!!! Nice word play Nathan! To be honest, we didn’t calculate the word total to verify the authenticity before we posted it. There are some things we do look for, before posting a POD and this one looked legit. When we saw your comment, we decided to take a deeper look. Hmmm… still doesn’t add up to me. And what is Bingo Bonus??? Never heard of that. My question is this… I’ve hit the two DW tiles on one word many times and it has never added the tiles times 2 than that number times 2. It has always added the total time 4. If that’s the way it is for landing two DW tiles on one word why is it different for landing in two TW tiles??? When you use all your tiles, you get the BINGO bonus of 35 points. This is standard. I didn’t know it was referred to as “bingo bonus” but yes I am aware of the extra 35 points for using all your tiles. I still question the authenticity of that score. The “Admin” addressed all other remarks about it being fake but mine… how come???? Hmmm… still have to wonder why the game would score landing on two TW tiles differently than landing one two DW tiles. In fact, it wouldn’t… I still say it’s bogus!!! Last time I checked 2×2 = 4 and 2 = 2 = 4 so that is why it works out that way when you multiply by 3 then by 3 again you get 9 not 6….do the math. mary mother of god. agreed with frisken. The most I’ve ever scored by total luck/chance is 243 points, and that happened exactly once. My 2nd best is around 150, which seems par for the course when it comes to big plays. If you look at the board and all the other words played, it would indicate that the players are not bright enough to come up with a play like that. I noticed this also. Quite a few 3 and 4 letter EASY words, then BAM quizzical. I don’t get why so many people are trying to bash the play or argue it can’t be real. Why not? Sometimes crazy, amazing or mind-blowing things DO happen. An easy way to cheat to try to get the highest score possible would be to play against yourself using two iPhones. You could make either player play unwanted letters, tile-swap, etc, until you get the tiles you need for the “winner” to make whatever word he wants. Not trying to call this a fake, but at the bottom there seems to be an invalid AA under CHOPS. How is that allowed? And if it is legit, why isn’t it part of the score? AA is a valid word (you can check the Words With Friends Dictionary) and it was on the board already. It is not part of the scoring of the word QUIZZICAL on this turn. The thing that would be more questionable is that someone played the word AA, which is extremely low scoring, during the game without it being wedged in at the end, to get rid of tiles or to hook another larger point value word. On the other hand it is hooked to the word HA, which would be a 5 point play, so it’s not completely out of the question that it was a legit play. It was clearly set up and not a normal game.Look in the upper right hand corner where “jus” is played.Nobody thought about putting a “t” there on the TW score? ?That would never happen if someone had the smarts to play a word like quizzical. Maybe they just didn’t notice? I mean, after all, maybe they just wanted to come up with a higher scoring word. OR JUST DID NOT HAVE A ‘T’ AT THE TIME!! The winner played with strategy. Making small words leave more blanks. It’s a strategic move. I am impressed! Most of the time I try to make big words or try to use all my letters as one time, but her it seems that this person had been saving some of his /her tiles to make a finally! anything is possible! IMPRESSIVE Nathan!! I don’t know how on earth you managed to get such a high score, but the proof is in the screenshot! Congratulations!!! It is EXTRAORDINARY!!! Oh, and I agree with shemo – nice strategy!!! Obviously a set up. Very fake. Almost like you opponent did not care that they were exposing many triple letter and word scores. It’s cool to that a score like that is possible. But come on, no respectable opponent would leave that much open. I play cheat free. There are many cheaters out there, but what fun is having a computer playing for you? I can’t believe the Admin doesn’t call this score bunk immediately upon seeing the game that was played. Very obvious set up. Still cool to see.